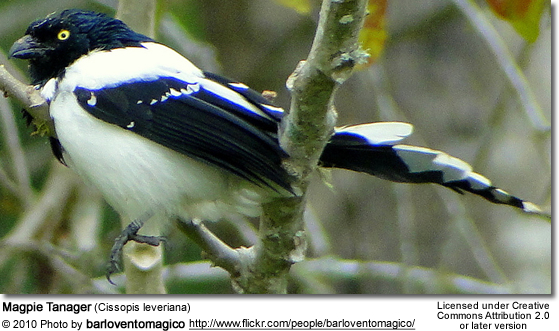 The Magpie Tanager (Cissopis leveriana) averages 26 to 29 cm in length and weighs 69-76 g. They are very noisy. 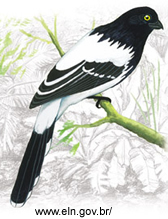 They can be found in the Andes in Venezuela, and in Colombia, Ecuador, and Peru; as well as in Brazil, Argentina and Bolivia at elevation between 1200-2000 m.
They are seen in river floodplains and forest edges among grass and shrubs, but also occur in plantations near human settlements. This tanager eats seed and fruits and insects. Cup nest lined with grass, leaves or other plant materials. 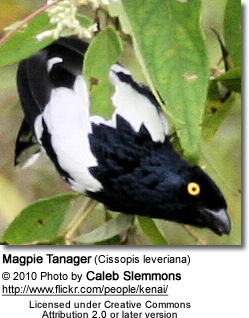 Located near ground on short trees or in shrubs in dense vegetation. Clutch size 2 eggs red/brown with brown spots. Captive birds incubate eggs for 12 to 13 days.